It's a great time to work with Ford, Lincoln and Mercury. This is a time of new distinctive design and high fuel economy vehicles as Ford adjusts to the changing market. That's why it was an exciting day yesterday when three vehicles I worked on debuted at the LA Auto Show, followed by three vehicle reveal websites. 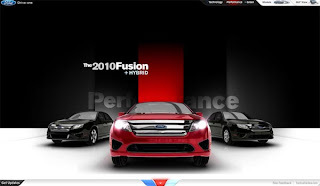 Two major launches included the new Ford Fusion + Fusion Hybrid and the Lincoln MKZ. We also developed some content to reveal the new Mercury Milan & Milan Hybrid. All the distraction of the industry aside, these are some solid products with major updates to their interiors, improved fuel economy, and the addition of a couple hybrid sedans. Since this is some of my work, I'll just let it speak for itself as I really cannot get into much about the strategic decisions without divulging proprietary information, so my apologies. I do think there is some beautiful work but I did learn a few things that I look forward to improving as we look to the Detroit Auto Show in January and what's to come then.